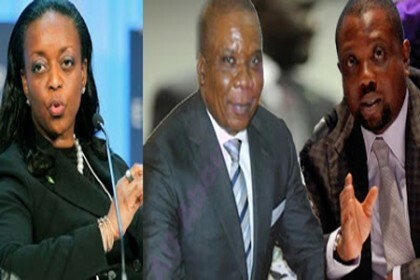 Court papers in Lagos Nigeria have detailed how oil businessmen, Kolawole Akanni Aluko and Jide Omokore laundered the $1.7 billion creamed off the questionable oil swap transactions between them and the NNPC, during the tenure of Diezani Alison-Madueke. Some of the money laundered through the United States and which had been used to acquire assets are now the subject of a forfeiture bid by the United States Justice Department. But the filings in a Lagos court have provided the most insightful details yet into how the entire money was laundered, while the Nigerian treasury was left dry and emasculated. According to an affidavit sworn at the Federal High Court by Isaac Kehinde Oginni, a lawyer in the Federal Ministry of Justice, both Aluko and Omokore lifted and sold allotted Nigeria’s crude oil. While they were paid for their service, they deliberately diverted to private use, what was due to the Federal Government and the people of Nigeria, in the sum of $1,762,338,184.40. *They bought vehicles with a combined value of over N800million and donated them to the Peoples Democratic Party (PDP) through its then National chairman Prince Secondus. *They also bought vehicles valued at over N130million and gave them as gifts to former minister of Petroleum, Mrs Dieziani Alison-Madueke and some other management staff of Nigerian Petroleum Development Company (NPDC). *Kolawole Aluko paid $18,548,619.99 and N1,070,000,000 to FBN Mortgages Limited as part payment for block A consisting of 26 Flats at 46 Gerrard Road Ikoyi Lagos. The block was bought for a total cost of N5,210,520,315. *Payment of a total sum of $25,839,606.77and N95,000,000 was made to Real Bank for the purpose of part financing the acquisition and renovation of properties by the Atlantic Energy Drilling Concepts Nigeria Limited (AEDC) and Atlantic Energy Brass Development limited (AEBD). The Properties are: Mason apartments at 6 Gerrard Road Ikoyi Lagos comprising 60 units of 3 bedrooms apartment valued at $78,000,000, Marion apartments Block 8 located at 4&5,Onikoyi Estate, Banana Island, Ikoyi, Lagos consisting of 43 units of apartments valued at $76,160,000, apartments at 33A Cooper Road Ikoyi, Lagos renovated at a total cost of $4,937,750, Admiralty Towers at 8 Gerrard Road Ikoyi, Lagos., which was also renovated. The two businessmen also transferred $69,912,981.15 to the following companies ;Mia Hotels Limited, First Motors Limited, V.I.Petrochemicals, Evergreen Reality &Management, WIz Trade limited, DE First Union Integrated Services and Amity Plus limited. Among the assets acquired were houses at: Grove End Road, London NW; 755 Sarbone Road, Los Angeles;952 North Alpine drive Los Angeles;815 Cima Del Mundo. He also bought land at 807 Coma Del Mundo in Los Angeles. After hiding his loot in many assets, he also bought the luxury $80million yacht, the Galactica Star, 58 exotic cars, expensive watches, private jets, Global Express S5-GMG and a Bombardier Global 6000 9H-OPE. Cash found in his bank accounts, according to documents before the court are: LDT Switzerland -$25million, Corner Bank, Lugano, Switzerland -$ 1million, Deutsche Bank, Geneva -$40million, HSBC London $175,000. He also had 75% shareholding in Atlantic Energy Drilling concepts Nigeria and Atlantic Energy Brass Development and 10% Shareholding in Seven Energy. The case came before Justice Oluremi Oguntoyinbo of the Federal High Court sitting in Ikoyi, Lagos state last Friday, incidentally the same day the US Justice Department filed a forfeiture bid at a court in Houston. The Nigerian judge adjourned hearing till 29th of September, 2017 to decide whether to stay proceeding in tune with an application filed by the defendants or continue with the case. The Federal Republic of Nigerian and two of its agencies are the plaintiffs and they are ranged against Aluko and Jide Omokore’s Atlantic Energy Drilling Concepts Nigeria Limited (AEDC) and Atlantic Energy Brass Development Limited (AEBD). The Nigerian government wants to recover $1.76 billion from the businessmen and their companies. Omokore is the chairman of the companies, while Kolawole Aluko is a Director. The company is urging the court to discharge or vary its order,as it relates to Marion Apartments, on the ground that the property located at Block 8 Plots 4&5 Onikoyi Estate, Banana Island, Ikoyi consists of 56 apartments owned and developed by the intervener. By virtue of two separate deeds of sublease, the intervener said it conveyed its interest in 43 out of the 56 apartments to Realblanc Energy Engineering limited, an affiliate of the defendants. The intervener contends that it still retains ownership of 13 out of the 56 apartments in Marion Apartments. It says that the order of the court is prejudicial to its interest and interferes with its right ownership over these flats. Last year, the Nigerian government had frozen the accounts of the defendants in 19 banks in Nigeria and eight offshore banks. This was sequel to the affidavit deposed by Oginni of the Federal ministry of Justice in Abuja and filed by a Lagos lawyer Oladipo Okpeseyi SAN. The court was urged as a matter of utmost urgency and public interest, in aid of administration of justice to issue a worldwide Mareva order restraining the defendants from dissipating all known assets directly or indirectly by the defendants including but not limited to assets listed on the face of the motion paper filed before the court. After hearing the submission of Okpeseyi, counsel to the Federal Government, Justice Oguntoyinbo restrained the defendants and their agents from demanding, receiving, transacting, mortgaging or whatsoever dealing in any manners with the assets of the defendants in banks, houses, land and shares in Nigeria and others located outside Nigeria ,while the Nigerian banks listed in the motion papers were ordered to within 7days to sequestrate all money and negotiable instruments standing to the credit of the defendants in the sum of $1,762,338,184.40 and keep same in an interest yielding account in the name of the Chief Registrar of the court as trustee of same pending the determination of the motion on notice. The court also ordered that its ruling should be served on the affected parties by way of advertisement in newspapers circulating within and outside the Federal Republic of Nigeria.